Finished in the top-six in point standings for the third consecutive time with a sixth place rank… Season highlight was a dominant weekend at the doubleheader in Detroit where he earned his first pole since 2008 for Race 1, held a 13-second lead at one point, led the most laps at 55 of 70 and won by a six-second margin for his fifth series victory. For Race 2 he set the second fastest time in his qualifying group to qualify third. In the race, he took over second on Lap 8 and the lead on Lap 23 and held an 18-second lead at one point and went on to lead the most laps at 41 en route to become the first back-to-back winner of the doubleheader… He earned his third podium of the season with third place in his home race at Mid-Ohio as well as a total of six top-five finishes and 12 top-10s during the season… Bad luck in five of the first six races that included late-race punctures in Long Beach and the Indy 500, and being hit on Lap 1 in St. Petersburg and Phoenix hindered his ultimate point standing as did an ill-time caution period after he started second in Toronto that relegated him to the back. Competed for Michael Shank Racing in an Acura NSX GT3. Started second in the GTD class and finished 11th. Earned one win (Texas) and a total of four podiums in his fourth season with Rahal Letterman Lanigan Racing to finish fifth in the season-ending standings with a total of 484 points… Led in six of 16 races for a total of 14 laps… Was fourth in laps completed with 2025 of 2070 possible. Competed for BMW Team RLL in the GTLM class in the Rolex 24 at Daytona, qualified third and retired from the race in 11th place in class after a mechanical failure at 3 a.m. led to contact while Lucas Luhr was driving… It was Rahal’s eighth time to compete in the event…. Co-drivers were John Edwards, Luhr and Kuno Wittmer. Earned his much-anticipated second series win in the 500-mile race at Auto Club Speedway in Fontana, Calif. and went on to earn his third in his home race at Mid-Ohio Sports Car Course. For the first time in his Indy car career, he was a championship contender and entered the season finale in Sonoma second in series points despite being taken out of the previous race in Pocono which limited his points lead on other contenders. He was also hit in the double-points paying season finale in Sonoma while in sixth place and dropped from second to a season-ending standing of fourth place after he finished 18th. He earned a series-high six podium finishes for Rahal Letterman Lanigan Racing and a career best fourth place rank in series standings. He was the top-ranked Honda-powered driver in the majority of practice and qualifying sessions as well as season-ending standing. Competed for BMW Team RLL in the GTLM class in the Rolex 24 at Daytona, qualified fourth, led their class and finished fourth despite an off-track excursion while J. Edwards was driving and subsequent car damage that put the team 24 laps down to the class leader… Co-drivers were John Edwards, Lucas Luhr and Jens Klingmann. Drove the No. 15 National Guard Honda in his second full season at Rahal Letterman Lanigan Racing... Season highlight was second place in Detroit Dual 1 where he led for 10 laps and challenged eventual winner and series champion Will Power for the win but finished 0.33 seconds back… Another highlight was leading 18 laps at Sonoma but had to pit for fuel with four laps to go… Finished 19th in Verizon IndyCar Series point standings with two top-five and four top-10 race finishes. Competed for BMW Team RLL in the GTLM class in the Rolex 24 at Daytona, ran as high as third and finished fourth despite a right rear bearing failure that led to 10 minutes of repair time in the garage area… Co-drivers were Dirk Mueller, John Edwards and Dirk Werner. 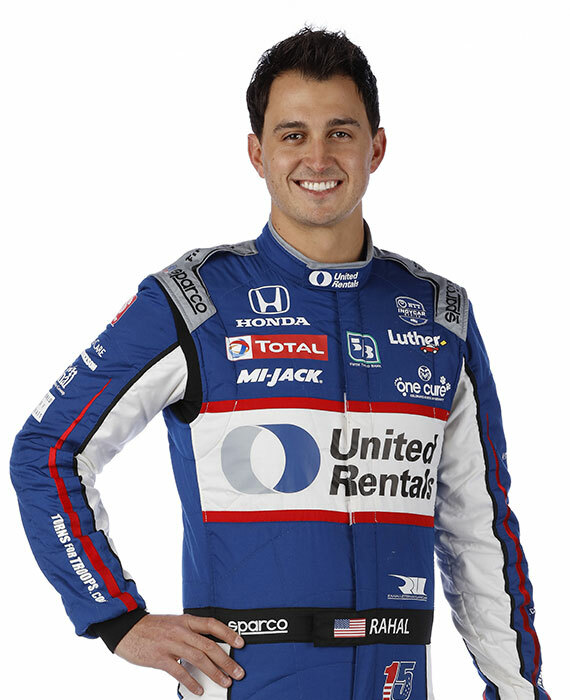 In a long-anticipated move, Graham signed a three-year contract to drive fulltime for his father’s team -- Rahal Letterman Lanigan Racing -- in November of 2012 to begin in 2013. Primary sponsorship came from TBC Retail Group with Valvoline as a major associate sponsor… His best finish of the season was second place in Long Beach and best start was sixth at Iowa after he won Heat Race 2 to qualify for Heat Race 3 and started the race sixth. He challenged for the win, including leading the race before he dropped to a fifth place finish after attempting to navigate traffic on the short track… Late-season staff changes led to improved results and competitive runs at Baltimore, where he led five laps but was taken out of the race after contact, and Houston… He finished 18th in the season-ending point standings with 319 points. Finished 10th in series point standings with a total of 333 points for Service Central Chip Ganassi Racing with a best finish of second at Texas, where he qualified third, led 27 laps and looked close to earning his second series victory but a slight brush of the wall with two laps to go forced him to settle for second place… Earned four top-five and seven top-10 finishes. Drove the No. 15 entry for Jack Daniel’s Racing with co-driver Rick Kelly on the Surfer’s Paradise, Australia street course. Started third but finished eighth in Race 1. Started fifth for Race 2, pitted in sixth place to hand the car over to his co-driver, who ran as high as second but ultimately finished 11th. Co-drove a BMW Riley for Chip Ganassi Racing with Felix Sabates. Co-drivers were Pruett, Rojas and Hand and they started 13th and finished sixth, four laps down. Ended season ninth in series point standings with a total of 320 points in his first season at Service Central Chip Ganassi Racing… Recorded six top-10 finishes, with a best of second at Sao Paulo… Led six laps at Indianapolis and finished third. Had starts of second, third and second in the final three races of the season. Co-drove the winning entry in the 2011 Rolex 24 at Daytona for Chip Ganassi Racing with Felix Sabates with Scott Pruett, Memo Rojas and RLL driver Joey Hand. Recorded seven top-10 finishes in 12 races (of 17) with four different teams… Highest finish of fifth place at Toronto and highest start of sixth place at Chicagoland came with Newman/Haas Racing (NHR)… Led one race (Iowa) for 11 laps… Competed in four races with Sarah Fisher Racing (St. Pete, Barber, Long Beach, Kentucky), at Indy with Rahal Letterman Racing, with NHR for six events (Quick Trim - Toronto, Sonoma, Chicago, Japan, Homestead; National Tire & Battery - Mid-Ohio) and one with Dreyer & Reinbold Racing (Iowa). Drove the No. 02 McDonald’s race car in his second season of IndyCar Series competition and third in the headline event of a major open-wheel series…Became the youngest driver to win pole position in series history with his pole at the St. Petersburg season-opener at the age of 20 years, 90 days. Marco Andretti previously held the record for his ’08 pole in Milwaukee at 21 years and 79 days old after he narrowly beat Rahal by 2/10th of a second over a four lap average… He also became the youngest pole sitter on an OVAL in series history when he won pole at Kansas at 20 years old (previous was Marco Andretti, ’08 Milwaukee at 21 yrs, 79 days)… Led 11 laps at Iowa Speedway… Earned a total of five top-five finishes including podiums at Richmond and Motegi… Earned the Firestone Tony Renna Rising Star award. Drove the No. 06 Hole in the Wall Camps entry in his first season of IndyCar Series competition and second in the headline event of a major open-wheel series…Became the youngest winner in IndyCar Series history when he drove to victory in his series debut in St. Pete at the age of 19 years and 93 days old. Margin of victory was 3.5-seconds over veterans Helio Castroneves and Tony Kanaan. He had only run 10 laps at testing speed in an ICS car on a road course (Sebring) due to a pre-race three hour test (4-1) being cancelled due to rain…Missed the series opener in Homestead due to a lack of time and parts to repair his lone race car after a testing crash the Tuesday prior to race day…Qualified ninth in St. Pete. The race began under caution while standing water was cleared and once the green flag flew he progressed up to third place before his first pit stop a race that saw multiple pit strategies. He was hit on Lap 37 by Will Power which caused a spin and he dropped to 23rd but the team elected to gamble and keep him on track while others pit on Lap 60 under caution and he moved into second before the restart on Lap 65 and took the lead and held it through two more restarts including one with three laps to go while holding off two-time St. Pete winner Helio Castroneves and Tony Kanaan. He won by a 3.5 second margin to become the youngest winner in series history at 19 years, 93 days old after he led a total of 19 of the 83 laps and moved to fourth in the standings…Started ninth in Champ Car series finale in Long Beach and was up to fourth when he was alongside Franck Montagny during an attempt to pass for third and was spun which dropped him back to 12th place. While setting the fastest laps of the race, he charged through the field and into seventh before he hit the tire barrier on the final lap to drop to a 13th place finish…Made his oval debut in Kansas, qualified 20th and finished a competitive 12th only one lap down to the leaders…Was the highest Indy 500 starter of the Champ Car transitioning teams with his 13th place qualifying position in his Indy debut but made contact on Lap 36 after driving high to avoid the slower car of Alex Lloyd. Retired in 33rd place…Missed his first pole at Milwaukee by 2/10th of a second over a four lap average and started a career best second to Andretti in what was the first Andretti/Rahal front row since 1992 in Loudon, NH. Ran between second and fourth until Lap 130 when he drove over “marbles” and lost control of his car after trying to go around the slower car of Manning. Retired in 25th place…Started 18th and finished 11th, one-lap down in his high-banked oval debut in Texas…Started 16th in Iowa based on point standings when qualifying was rained out and earned his highest oval finish to date of 10th place…Earned his second highest start of the season with third in Richmond and held the position through his first stint but crashed on Lap 132 of 300 and retired in 18th place…Crashed in the Saturday morning practice at Watkins Glen and qualified 18th but rebounded to finish eighth…Qualified 10th in Nashville, ran as high as 9th and finished 12th in the rain-shortened race…Started 14th and ran as high as eighth in Mid-Ohio but an off track excursion on Lap 53 limited him to a 16th place finish at his home track…Started eighth in Edmonton but was hit on L1 by 10th place starter Mario Moraes. Team repaired damaged and he returned on L16 but was hit on L61 of 91 by Viso, who later served a 15-second penalty for avoidable contact. Retired in 16th place…Started 20th in Kentucky and charged to 12th in the opening laps before gearbox failure ended his race after 28/200 laps and he retired in 25th place…Started 15th in Sonoma and utilized an alternate fuel strategy to finish 8th …Progressed to the Firestone Fast Six for the first time in Detroit and qualified sixth. Choose the same pit strategy as then race leader Dixon which almost worked but a late race fourth caution botched the plan and he had to stop for a splash of fuel with three laps to go and dropped to 13th…Started 14th in the season-finale near Chicago and ran as high as fifth place but mid race contact in the pits with Buddy Rice and contact with the wall on the final lap most likely due to a compromised part from the pit contact led to a 19th place finish….Ended the season ranked 17th with 288 points…In the exhibition race in Australia, he started 13th after rain hindered his qualifying effort and finished ninth… Rahal and his teammate Justin Wilson (Detroit) were the only two drivers transitioning from Champ Car to win during the season. Drove a Formula One car for the first time when BMW contracted him to drive their BMW Sauber race car at the Las Vegas Consumer Electronics Show for four days in January on a purpose-made Pit Lane Park track. Competed in the Rolex 24 at Daytona for the third time…Co-drove a Ford Riley for Michael Shank Racing with Justin Wilson, Oswaldo Negri and Mark Patterson. Started from pole and overcame several minor problems while running in the lead pack until Wilson hit curbing that led to extensive repairs but the team came back to finish sixth. Earned four podium finishes -- including becoming the youngest driver in series history to earn a podium finish with second place in Houston -- to finish fifth in season-ending standings…Finished second in the Rookie of the Year standings to former Formula One test and race driver Robert Doornbos…Led three races (Cleveland, Mont Tremblant, Belgium) for a total of 18 laps led during the season and set the Fastest Race Lap in Australia…His season got off to a difficult start when the team had an electrical problem in Friday’s qualifying in Las Vegas and he had to qualifying his backup car on Saturday due to crashing in the morning practice. Started the race 10th but had to make an evasive move to avoid a swerving Dan Clarke and hit the wall prior to Turn 1 on the first racing lap. Retired in 17th place… Qualified fifth in Long Beach but pit strategy of others and slow fuel flow on two stops led to an eighth place finish…Started sixth in Houston and finished second to bring the team it’s first 1-2 finish since Las Vegas in 2005. His second place finish earned him the distinction of being the youngest podium finisher in series history…Started eighth in Portland but struggled to pass Clarke and went off course twice while trying and ultimately finished ninth…Earned his highest start to date of fourth in his home race in Cleveland but a battle for position with Doornbos led to being hit from behind by Tracy and he went off course and subsequently to the rear of the field. Came back to lead four laps for the first time in his Champ Car career and had a late race battle with leader Tracy but had to pit for five gallons of fuel and finished eighth…Started ninth in Mont Tremblant and took the lead for seven laps before his final pit stop but was held up due to a shifting problem which led to a stalled car and he rejoined the field 10th. Finished seventh to tie with Oriol Servia for eighth place…He started 15th in Toronto but an evasive move to avoid a pile-up on Lap 1 led to him hitting the wall and a subsequent stop for a new front wing. He had to pit again for another front wing later in the race after running as high as second. Retired in 11th place after he made contact for the third time due to a broken steering rack…Started fourth and finished third in Edmonton… Started sixth, ran as high as fourth and finished sixth in San Jose after he charged back from a problem (stalled) on his first pit stop that dropped him to 13th…Started fourth, ran as high as second and finished third in Elkhart Lake to move from eighth to fifth in the point standings…Ran a lap quick enough for P2 in qualifying but had to abort it and started 13th in Belgium. Different strategy saw him lead seven laps and finish third…Started sixth in Holland, ran as high as fourth and finished ninth after two off-course excursions…Started ninth in Australia and ran as high as fifth before he was hit from behind by Philippe which dropped him to the back and he ultimately finished 11th but maintained his fifth place rank with 220 points…Started seventh in Mexico City and ran third for most of the race including the late stages but was passed by Oriol Servia after the final restart and finished fourth to guarantee a fifth place, season-ending rank with 243 points…Nominated for Rookie of the Year by esteemed racing magazine Autosport along with fellow drivers Robert Doornbos and ultimate winner and Formula One driver Lewis Hamilton. Competed in the Rolex 24 at Daytona for the second time. Drove a Lexus Riley for Southard Motorsports with co-drivers Shane Lewis and Randy Ruhlman. The team retired 28th in class after a water pump failure…Made his debut for Rahal Letterman Racing (RLR), his father Bobby’s team, at the American Le Mans Series-sanctioned 12 Hours of Sebring. Competed in a Porsche 911 in the GT2 category with Ralf Kelleners and Tom Milner. Started eighth in class and battled back to a sixth place finish after damage from an opening lap incident dropped them to 18th…Competed again for RLR in the Petite LeMans race at Road Atlanta where he and his teammates started fourth, led twice and finished third after three flat tires. Finished second in the series standings after a title fight that concluded in the season finale. Earned a series-high five wins, four poles and six podium finishes in the 12 events and at 17 years old was the youngest race winner in series history (Monterrey, Mexico on 5-21-06)…He led the most laps (129, 32 percent) and set a series-high five fastest race laps …He was awarded the BBS of America Rising Star Award. Joined Team Lebanon in the A1GP series for the final three races in the ‘05/’06 season and competed in Mexico, USA and China. His highest qualifying and finishing position was 11th…He competed in one race in the ‘06/’07 season in the Czech Republic with a 12th place finishing position… Rahal is of Lebanese descent. He started from pole and led 21 laps en route to a second place finish in his lone IndyPro event during the US Grand Prix at Indianapolis Motor Speedway (now called Indy Lights). His team qualified first in the GT class and finished sixth in his debut at the Rolex 24 at Daytona with Tafel Racing and also made his debut in the 12 Hours of Sebring in an Alex Job Racing Porsche in the GT2 class where he and his teammates finished sixth after qualifying fourth. Finished fourth in the championship with one win and six podium finishes in 12 races…He posted a podium finish in his debut starting sixth and finished third at Sebring…Started fourth and posted his first professional win in Portland and became the youngest race winner in series history… Posted back-to-back second place finishes at Montreal and Pikes Peak…Finished second at Road Atlanta. Claimed the SCCA National Formula Atlantic championship at the SCCA National Championship Runoffs at Mid-Ohio Sports Car Course. His father Bobby was the 1975 Formula Atlantic National Champion…Also started from pole and won the SCCA National event at Road Atlanta. Competed in the series on a scholarship and received an exemption to run at the age of 15…Finished third in the USA BMW Rookie of the Year battle and seventh overall…Earned four top-five results and 11 top-10 finishes in 14 races despite being the youngest driver in the series…Earned his first front row start in Road America and led the first lap…Later earned his first podium finish at Denver with a third place result. Got his start in racing in 2000 in the Ohio Valley Karting Association regional series at the age of 11. He won 9 of 16 races and was named Rookie of the Year in the 100cc class…In 2001 he competed in the regional kart races in as well as selected national events…In 2002 he continued to earn wins and podium finishes in kart races…In 2003 he moved up to the Stars of Karting national championship and finished fourth overall in the national point standings. The season highlight was his win in the national championship at Road America.